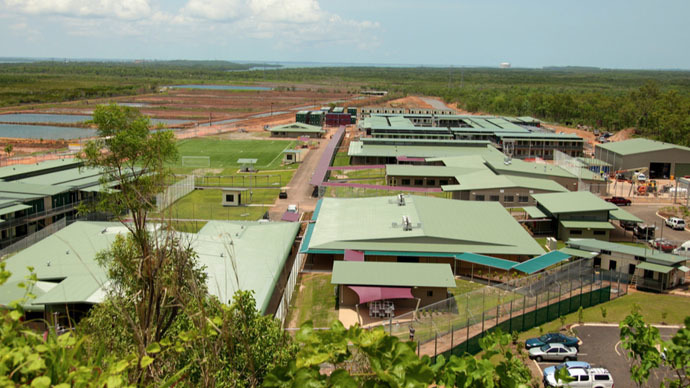 A disturbance has erupted at Wickham Point Detention Centre, in Darwin, Australia, with 20 inmates reportedly harming themselves to prevent their transfer to Nauru Island. The information comes from an asylum seeker, according to ABC News Australia. Police have confirmed they received a call from the facility, and were on their way to the scene. A woman who says she saw people harming themselves is now at Royal Darwin Hospital. Police responded to the mayhem at the facility just before 4pm local time (6:30am GMT), following reports of inmates damaging property and rioting, according to a police spokeswoman. The Refugee Action Coalition reported that about 70 asylum seekers were involved. However, immigration authorities deny any major riot. "A disturbance occurred involving detainees resulted in minor property damage," an Immigration Department spokesman said, as cited by AAP news agency. During the past couple of weeks, there has been a dramatic decline in the mental health of the detention population, according to Ben Pynt from DASSAN (Darwin Asylum Seekers Support and Advocacy Network). “We have seen a spike in self-harm and attempted suicides, and it is really troubling the lengths that people are going to either to prevent themselves being sent offshore to Manus and Nauru, or simply in protest at their detention conditions," Mr Pynt said, as quoted by ABC News Australia. “People are absolutely desperate. They feel that they are going to be in detention forever,” he added. Asylum seekers believed to be sent offshore was "a fate worse than dying," Pynt said. The Nauru detention center consists of two separated tent camps, and can hold up to 1,200 inmates. Reports of bad conditions and alleged abuse caused the Australian government to carry out a review, which appeared last month. Former Integrity Commissioner Philip Moss, who conducted the research, confirmed allegations that asylum seekers, including small children, were raped and physically abused at the facility. In exchange for taking a shower, some women were forced to give sexual favors. Save The Children charity workers were prohibited from entering the camps. Facility authorities said they could start protests among the refugees, according to the review. Staff at the facility expressed readiness to testify at the Senate probe, saying the government knew about the notorious practices at the detention center for months before it took steps to deal with it.